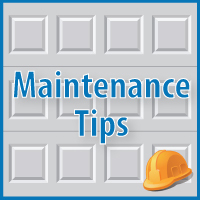 Look carefully for cracks and holes in your wood garage doors. These need to be tended to straight away because they are letting moisture weaken the wood. Chip away any cracks and smooth out rough areas, as this will preserve the structural integrity of your wood garage doors. Spray a high quality lubricant on any hinges, tracks and rollers on the garage door. These will be the only metallic parts and if they rust it will become very difficult to open and close the wood garage doors.